Hereditary angioedema (HAE) is a disease that is passed on genetically and triggers recurrent swelling (angioedema) of the skin, mucous membranes and internal organs that can be very severe. The swelling can occur in the face, the throat, on the arms and legs and in the intestinal tract, the reproductive organs and on the buttocks. The attacks are often accompanied by severe pain. In the intestinal tract, the swelling can trigger colic-like spasms that are often accompanied by nausea, vomiting and diarrhea. 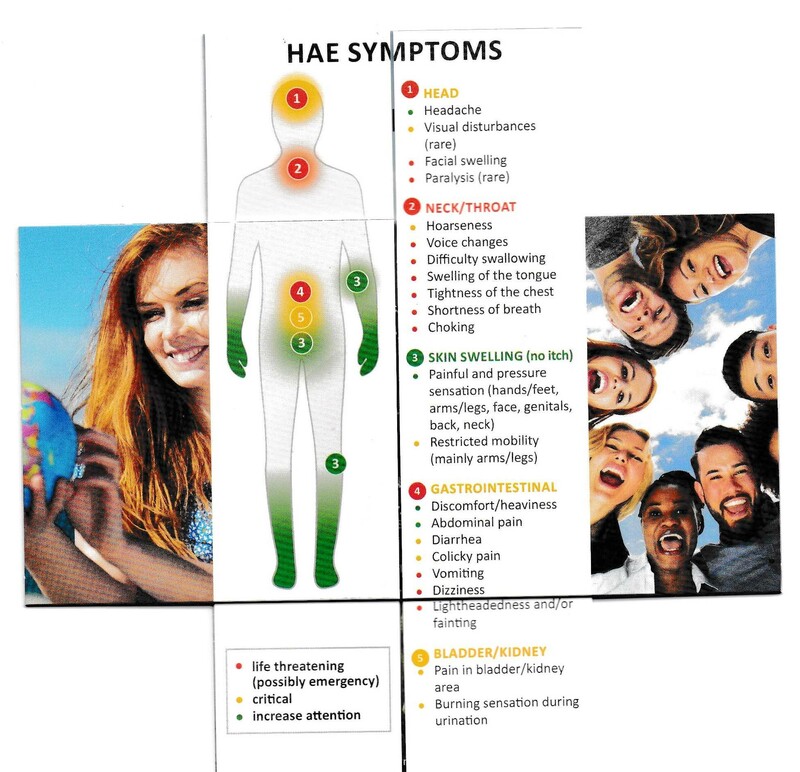 HAE is caused by a genetic defect that results in an inherited deficiency of a blood plasma protein (C1 esterase inhibiter). This increases the level of the tissue hormone bradykinin, which in turn increases the permeability of the vascular walls. This causes the swellings. When swelling occurs in the upper airways, it must be treated immediately to prevent suffocation. Since HAE is a dominant genetic disorder, children have a 50% chance to inherit it from one of their parents. HAE will not skip a generation. There is an exception to this. When the defect occurs for the first time in a patient, it is referred to as a new mutation. In this case, neither of the parents has the defect. In general, HAE occurs in 1:150 000 births worldwide and there is no pattern geographically, racially or anything else. It seems to be completely random. The life of HAE patients is often filled with lost potential. This would probably apply to most allergies too. It has been found that people with rare diseases have a greater rate of anxiety and depression. Because this is such a rare disease there is little awareness, even amongst the medical fraternity, so it is vitally important that the patients themselves are educated about the disease and are consequently confident enough to oversee their own treatment. This in itself is a complete turnaround. The big thing to overcome is for the medical fraternity to learn to listen to the patient who probably knows more about the disease than anyone else. All patients are encouraged to carry a patient card and on it will be both international and local web addresses and contacts. Medical ignorance, arrogance and delays need to be eliminated. Although the treatment of HAE worldwide generally falls within the ambit of the allergy sector, it is NOT AN ALLERGY. For this reason, the usual allergy treatments namely Antihistamines, Adrenalin and Glucocorticoids DO NOT WORK. Research has concluded that the quicker the attack is arrested the shorter will be the duration of the attack. It is all about speed of diagnosis. Attacks can last up to 5 days. There are a number of modern meds available although as yet none are registered in SA. Acute medications for example, Berinert and soon Ruconest, have to be infused so require specialist application but are vital to prevent death from larangeal attacks. Patients in some countries however are taught to self-infuse and they work extremely well and quickly. Berinert is used in SA by some patients who can import it on a named patient basis. Another acute medication Firazyr (Icatabant) is a subcutaneous self-administrable medication which would be ideal for SA, but is very expensive. It was trialed in SA a few years ago and there are 2 patients who still qualify to receive supply. Similar more affordable products need to be investigated for SA. Worldwide they are currently testing a once a day tablet and part of that trial is to be carried out at the Lung Clinic in Cape Town. HAE patients all present differently, so the concept of individualised replacement therapy (IRT) is going to be the best option. Diagnosis is extremely difficult and can sometimes take from anything from 2 – 20 years. The quickest way to test in SA is to test C1 and C4 levels, which if low, can indicate HAE.